Paul displays his rather unusual catch. Carefully. Weird catches I’ve made run the gamut: sea turtles, pelicans and gulls, squid—the list is a long one. And, of course, none of these were made on purpose. Well, okay, I have targeted the squid a time or two, but I’ve caught them by accident as well. 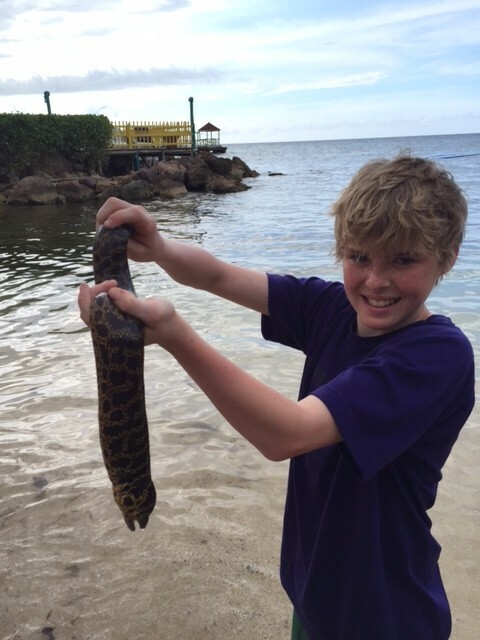 But the weird catch of the week award goes to Paul Saum, who was vacationing with his family in Jamaica when he dropped a line off the resort dock, and pulled up this moray eel. When you make an unusual catch, think carefully about what you do next. Would you eat the slithery critter pictured here? Probably not. News flash: they’re delicious. Would you drop a freshly-caught squid in the cooler? A bizarre-looking filefish? Same news flash, in both cases. Not so much, for the sea birds. And, of course, keeping (or even messing about with) a sea turtle is strictly verbotin. I’m betting that most of the folks reading this have made a few bizarre, strange, and weird catches of their own. I want to hear about them, and I’ll bet a slew of other FishGame readers do, too. So click on Add A Comment below, and let us know about your weirdest catch ever. Who knows? Maybe I’ll even name yours the weirdest catch of the week. (The prize? Just bragging rights, but we say that counts for a lot in this case). Sea creatures, airborne critters—even boots. Whatever, the weirder the better.